A rainy day in May at Romania´s Black Sea coast. Some good birds for a western birdwatcher like Reed, Corn and Black-headed Bunting, Great Reed-Warbler, Barred Warbler and a flying Lesser Spotted Eagle could be seen. 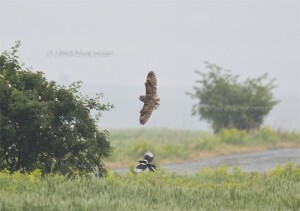 A big surprise was what you see on the pictures: a Long-eared Owl, Asio otus, staying in a bush, eventually flying away. After a few seconds a Magpie showed up. Here you can see the Long Eared Owl chased by a Black-billed Magpie in flight. The images were photographed in the nice countryside of Romania north of the city of Constanta. 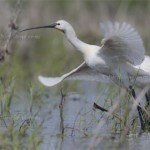 2012 might become a good year for the Eurasian Spoonbill , Platalea leucorodia, in Germay – and a good year for the birdwatcher to observe one far away from the coasts. Right now, you can see up to 8 individuals at the “Große Flutmulde” on the Bislicher Insel near Wesel/ Lower rhine valley. Another location is the nature reserve “Bingenheimer Ried” in the Wetterau near the town of Giessen/ Hessen, where one individual has been seen at least until the 19th of June 2012. The Eurasian Spoonbill is a rare breeding bird in europe with a stronghold in the northwestern part of the Netherlands (Ijsselmeer) or Germany. 46 years ago, Urs N. Glutz von Blotzheim wrote in his „Handbuch der Vögel Mitteleuropas“, Band 1. 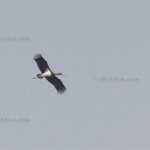 Gaviiformes – Phoenicopteriformes that only in 1962 there have been successful breeding on the island of Memmert and that Eurasian Spoonbill could be seen in Germany only on the north-western coast or – very rare – in Bavaria. Since then, western populations have increased during the last decades. But still, in the center of Germany this bird is a rare but regular visitor. Mainly there are birds in non-breeding plumage, but a Eurasian Spoonbill in breeding plumage could be seen on 15th of June 2007 in Niederweimar near the town of Marburg/ Hessen. The European Common Cuckoo, Cuculus canorus, has always been a miraculous bird. His loud and simple song and his arrival as a migrant in Europe signaling spring time made him one of the best-known birds in Europe. Quite recently his migration made the British Trust for Ornithology (BTO) track Cuckoos via attached satellite-tracking devices to find out more about their important stop-over sites and wintering destinations on the way to and from Africa. Very reknown – but not often seen – is the cuckoo´s notorious behavior to parasite other birds brood. Especially this attidude made him unique in the awareness also for people in Europe who are not claiming to be keen birdwatchers. The Fall webworm moth (Hyphantria cunea) seems to like the Bazilescu Park, a small park near the home of Cristian Mihai in Bucharest. 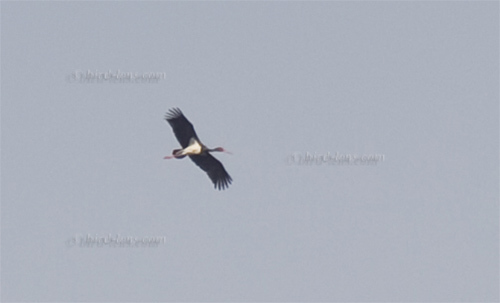 During the last weeks beginning in May he saw maybe hundreds of individuals from this species, most of them entirely white, only a few showing a variable number of black dots (see first two pics in his article on birdforum). 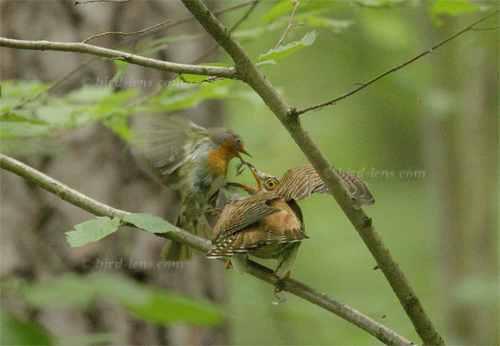 During this time, Cristian Mihai had the opportunity to see a lot of birds eating them. They are easy to find, because they are easy to spot on the dark bark of the trees, sometimes gathered in large numbers (for instance, in a morning, Cristian Mihai saw a tree with more than twenty moths from this species on its bark). 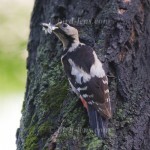 During this season, birds obviously need a lot of food for chicks, so this “invasion” seems to be highly appreciated by them, as you can see in the image of a Syrian Woodpecker here. 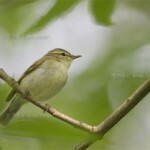 The Greenish Warbler – or Grünlaubsänger in german – could be observed in the little town of Hilchenbach (427 asl) in the Siegerland on the edge of the state of North-Rhine Westfalia. The Greenish Warbler has established as a breeding bird in South Finland and at the coast of the eastern Baltic sea quite recently. But a singing Greenish Warbler in the Siegerland on the edge of the state of North-Rhine Westfalia in the middle of Germany is an exception nonetheless. This indivudual could be seen on the 10th of June 2012 along a stream near a retirement home in the center of the town. First the local ornithologists assumed it would be a Taiga Chiffchaff (Phylloscopus tristis or Sibirischer Zilpzalp), who managed to make its way to Hilchenbach. Deliberate singing made the identification easy eventually. 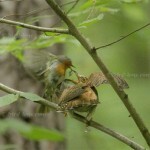 The Warbler was discovered on the 1st of June and had been seen by several observers in the meantime. One other discovery in the state of North-Rhine Westfalia dates back to the year 1987, when a singing male was observered in Heiligenhaus near Overath 40 kilometers west of Cologne.